Colorado and Nevada achieved higher rankings in the 2018 State Energy Efficiency Scorecard released today by the American Council for an Energy-Efficient Economy (ACEEE), while New Mexico, Utah, and Wyoming fell compared to their rankings in the 2017 State Energy Efficiency Scorecard. Arizona’s ranking remained unchanged. Among southwest states, Nevada moved up the most, from 34th place in 2017 to 29th place in 2018. Energy efficiency legislation adopted in 2017 and a proposed expansion of utility energy efficiency programs helped Nevada improve its ranking. Colorado moved up from 15th place in 2017 to 14th place in 2018, meaning Colorado remained the top state in the Southwest region. “We applaud Colorado and Nevada for the important steps they have taken on energy efficiency policy, which in turn will increase energy and dollar savings for families and businesses in both states,” said Howard Geller, Executive Director of the Southwest Energy Efficiency Project (SWEEP). Colorado and Nevada gained points for adopting new transportation energy efficiency initiatives as well as utility energy efficiency policies. Utah dropped the most among Southwest states, falling from 17th place (in a tie with Arizona) in 2017 to 20th place in 2018. “Utah lost points in the transportation and combined heat and power areas, while other states such as New Jersey and Pennsylvania added points and leaped over Utah in the rankings. Utah is at risk of falling further in the state rankings if utility energy efficiency programs are scaled back, something Rocky Mountain Power (the main electric utility in Utah) is now contemplating,” said Sarah Wright, Executive Director of Utah Clean Energy. New Mexico fell from 35th place to 36th place, and Wyoming from 49th to 51st place in the 2018 state rankings. “New Mexico and Wyoming have limited or, in some cases, out-of-date energy efficiency policies and this is reflected in the ACEEE Scorecard. We encourage both states to adopt new policies to improve the energy efficiency of homes, workplaces, and vehicles, which will also help the states move up in the ACEEE Scorecard,” said Tammy Fiebelkorn, New Mexico Representative for SWEEP. Arizona ranked in 17th place in the 2018 State Energy Efficiency Scorecard, the same position as in 2017. “SWEEP praises Arizona for ranking in the top 20 states for many years. However, Arizona risks falling out of the top 20 if cuts to energy efficiency programs proposed by the investor-owned electric utilities are approved. 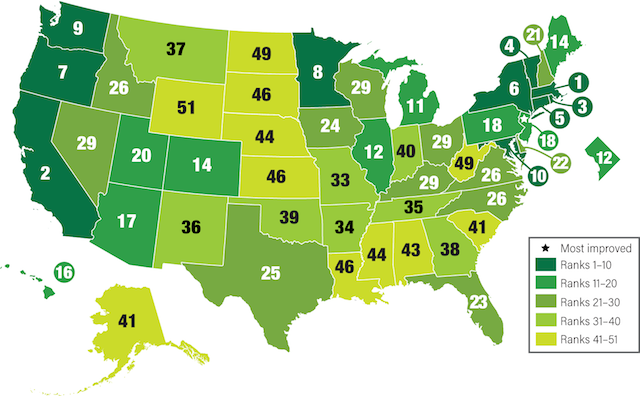 Arizona also scores poorly with respect to building energy efficiency policies. We encourage Arizona to step up its utility and buildings policies in particular,” said Jeff Schlegel, Arizona Representative for SWEEP. The annual ACEEE State Energy Efficiency Scorecard measures states’ progress on a variety of energy efficiency efforts including utility policies and programs, transportation policies, building energy efficiency policies, combined heat and power, and state government initiatives.